As the 1990s began, Japanese toy manufacturer Taiyo was in the middle of a winning streak. 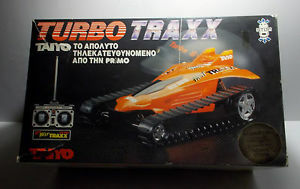 And their latest sensation – the rubber tracked ‘Fast Traxx’ would go on to become one of their biggest hits. Who knew that a toy with tank tracks could move so damn…fast? But what if tanks went as fast as off-road racing cars? Well, that was precisely the idea Taiyo had, as the 1980s drew to a close. Taiyo had been a maker of tin toys in post-war Japan, first coming to prominence in the 1960s and 70s. Like so many other Japanese companies, they were gradually improving the quality of their products over time, and beginning to find customers around the world as confidence grew in the reliability of Japanese-manufactured goods. Some early Taiyo toys are now worth a lot of money to tin-toy collectors. 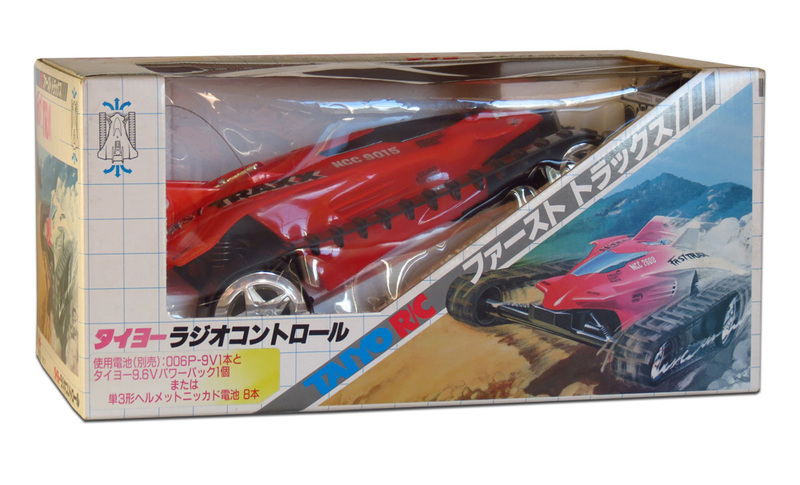 But for me, being a plastic-loving child of the MTV era, the most interesting part of the Taiyo story began in the mid-1970s when they first dipped their toes into the new world of R/C toys. By the mid-1980s, Taiyo was starting to experience major worldwide success with hits like the Turbo Hopper / Jet Hopper and 4×4 Off-Roader, and they were manufacturing these models both for direct sale and as custom orders for major American companies like Tyco and Radio Shack. As the 1990s began, the collaboration between Taiyo and the US company Tyco had become particularly successful, yielding a range of colourful and creative R/C vehicles that nobody had ever seen the likes of before, and which sold particularly strongly in the USA. 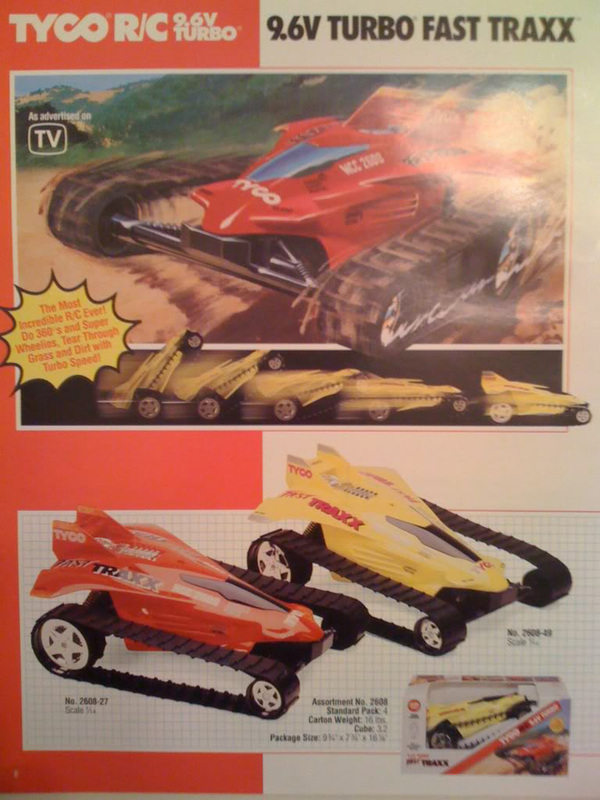 I don’t specifically know how much (if any) input Tyco had into these products, but they certainly seemed perfect for Tyco’s audience – young kids who craved toys that were tough and action-packed, with the odd performance gimmick thrown in. Elsewhere, the hobby of professional R/C model racing had become a well established, competitive and expensive sport. 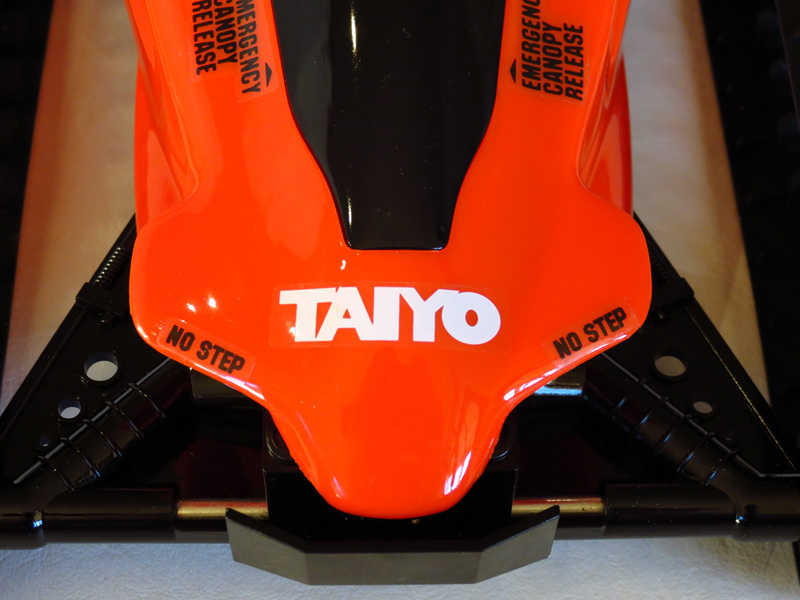 And in a sense, Taiyo’s R/C products were the antithesis of everything that professional R/C racing stood for – instead of complex high performance kits, they were simple R/C toys that were ready to run out of the box. And while Taiyo was certainly not the only company offering such products, for a few years they were arguably the most popular. 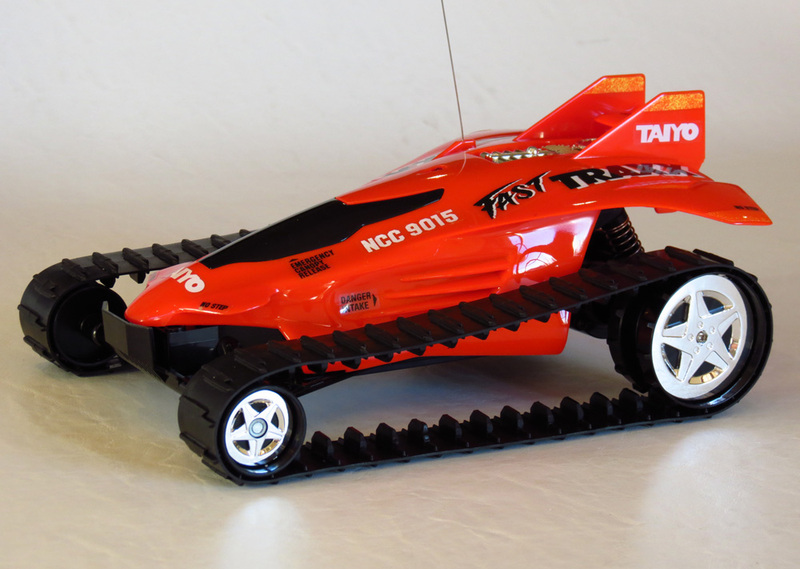 The Fast Traxx represents one of Taiyo’s most successful releases, in a long line of eye-catching R/C products that offered straightforward thrills and spills for people in their backyards. Taiyo “Fast Tracks” was developed by adding a running characteristic of the tank, to the high speed. Abroad, it becomes very popular product. And popular it certainly was. 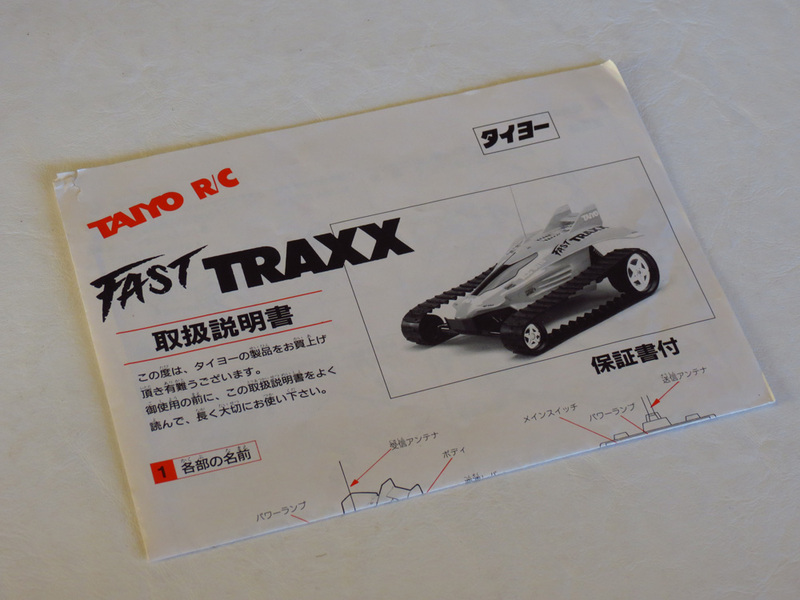 In the book FAO Schwarz Toys For A Lifetime: Enhancing Childhood Through Play (1999), the Fast Traxx is mentioned as one of the highest selling R/C vehicles of all time. Out of the box, the car is a sleek mash-up of a futuristic neon jet fighter, and well, an army tank – a crazy looking contraption at first. I can actually remember when those frenetic commercials appeared on my TV screen in the early 1990s. It seemed as if they were advertisting some neon blur whipping up a cloud of dust. And someone was yelling at me to buy it. 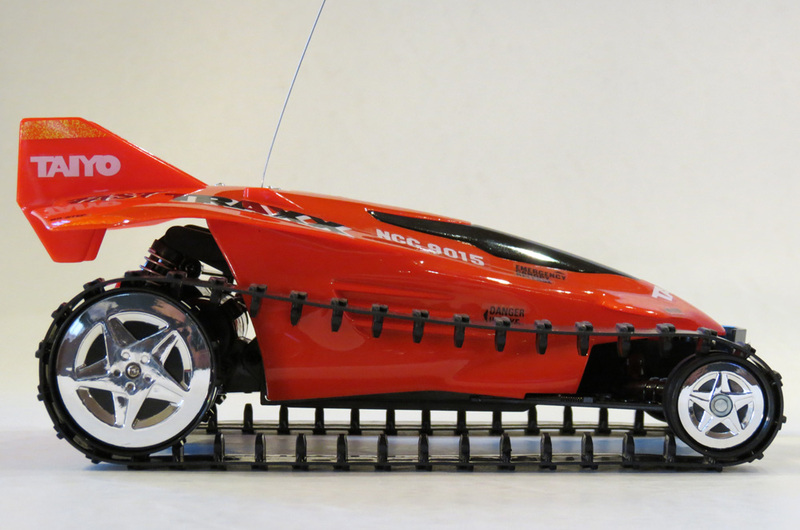 I mean, how many R/C toys did you ever see back in those days, that could run this easily through snow? As mentioned, controlling the Fast Traxx is not for the faint-hearted. The transmitter is not the usual forward-reverse/left-right. It’s forward-reverse/forward-reverse! Each lever simply operates the speed of the rubber track on one side, or the other. Push both, and both tracks turn at the same speed, propelling the car straight ahead. Release one, and you’ll start to take a corner. But push one lever alone when the car is standing still, and the Fast Traxx may go into a crazy 360° spin on the spot. Needless to say, the first time you drive it, you’ll probably slam head-on into a wall or tree at some point, as the only way to prevent collisions is often to go from full forward to full reverse in a hurry. Kudos to Taiyo for building these toys to last, because the gearbox had to be relatively robust to handle the kind of action shown on the commercials, without stripping itself in a hurry. Obviously racing a Fast Traxx against another toy, around any kind of predefined course or track, is going to be a challenge. Taking corners with a Fast Traxx is a sort of imprecise process that requires accelerating both tracks and then “letting off” a little on one side to make the vehicle veer a bit left or right. How much you let off, determines the angle of the corner. I’m sure there are some of you out there who drove Fast Traxx vehicles for long enough to become expert drivers – but it sure would have taken some practice. And as such, most of the play value in the Fast Traxx came from blasting the vehicle in whatever direction was easiest at the time, and just seeing what happened. The twin motors (you can see a motor hidden behind each rear spring in the photo above) were an idea that had already appeared in a few other toys before the 1990s, and even a few from Taiyo. But in previous incarnations the concept had been used to simply make cars go faster. In the case of the Fast Traxx, I think it was probably essential to dedicate an entire small motor to each side of the vehicle – as the friction caused by the amount of surface area that two large rubber tracks were continually rubbing against, might have been too much for a single small motor to handle. And Taiyo’s goal had always been to be able to put a large “21km/h!” sign on the box, so the vehicle really needed plenty of get-up-and-go. Naturally, running two motors on a device with more friction, also results in a quicker drain to the battery. And I’ve seen some people lament the fact that their memories of the Fast Traxx were often of it running down it’s battery after a short while. But hey – wasn’t that the same for every toy in the 1980s? It certainly was when it came to R/C, as most of us were getting about 8 minutes out of our 7.2volt battery pack powered cars, and then using 12-hour trickle chargers to recharge them overnight. Oh, the waiting! You were the lucky kid if you owned a 4-hour “fast charger”. It’s all sounding very much like US Air Force fighter jet parlance, and very cool when you’re 12 and building a ramp to launch your Fast Traxx into the air. But what happens when it’s time to land? 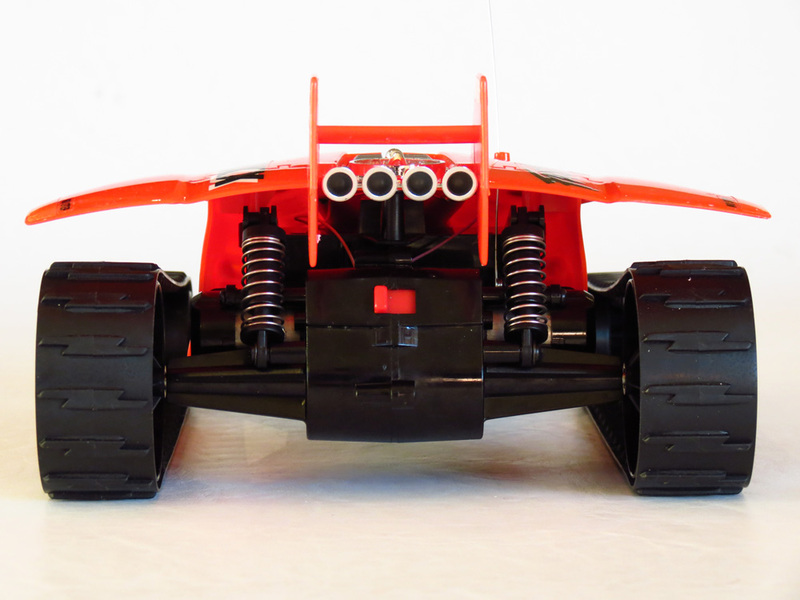 Well, the Fast Traxx is one tough little tank-buggy, and does have some basic rolling-rigid axle spring suspension at the back to help it cope with bumps. Curiously, no suspension at the front though…except some faux spring detail. But the front is also very lightweight, meaning there’s less pressure on the chassis at that end, and it generally ends up crawling over obstacles anyway. The vehicle also generates enough power to rear up on it’s haunches and do “wheelies”, further reducing downward impacts at the front end. 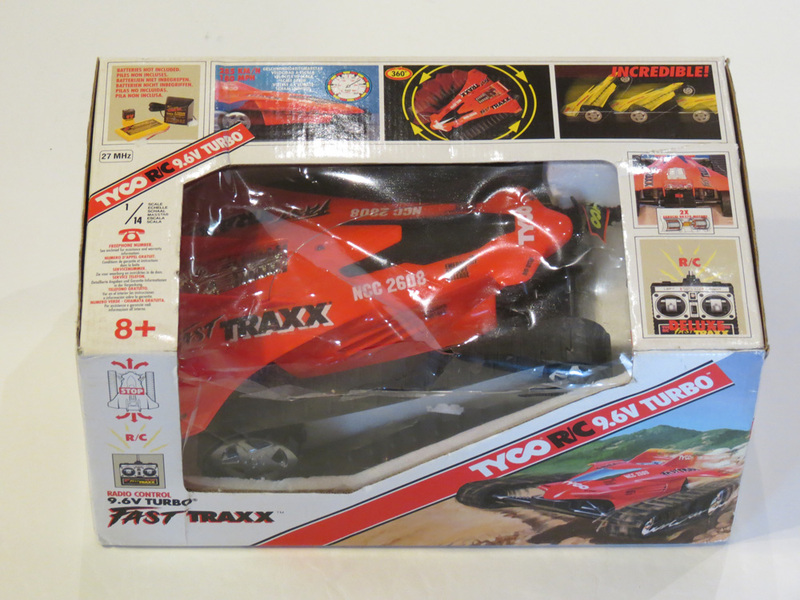 And another thing – the box of my Fast Traxx actually makes mention of “4WD”. Are they a true 4WD? I suppose they are. Except that there’s no gearbox at the front, and the front wheels are simply free spinners, locked into rotation by the rubber tracks. Not too different to the function of a belt driven 4×4 gearbox system. But definitely simpler. The rubber tracks are, of course, the most essential feature of the whole design and judging from the high value of brand new spare tracks on the collector’s market these days, they are a part that eventually wears out and needs to be replaced – either due to dry rot, stretching or general wear and tear. But most of the used examples of the Fast Traxx that you see around these days still have their tracks, and the tracks still have tread on them. 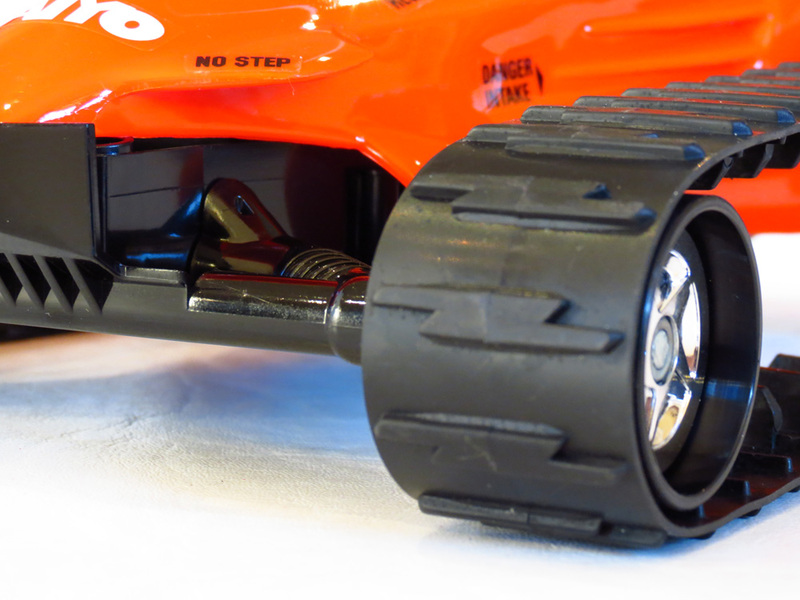 With the friction and wear spread out over such a large area, rubber tracks tended to last longer than the tiny rear pin spike tyres on your average R/C buggy from the 1980s (which often wore out very quickly, particularly on concrete). Today, as always with ready to run R/C cars, it’s pretty hard to find brand new examples of the Fast Traxx. But used examples are quite common. And there is certainly plenty of demand for them, whether in good condition, or just for parts. After the success of the Fast Traxx, Taiyo continued the tracked concept with a range of other R/C sequels – the Mini Fast Traxx (smaller), Super Fast Traxx (larger and 7.2volt battery powered), Fast Traxx Pickup and Fast Traxx Eliminator (both featuring pickup truck style bodies), Half Traxx (a really cool combination of tracked wheels and regular wheels), and the Maxx Traxx (a bizarre vehicle for which I have no explanation!). And what about souvenirs? 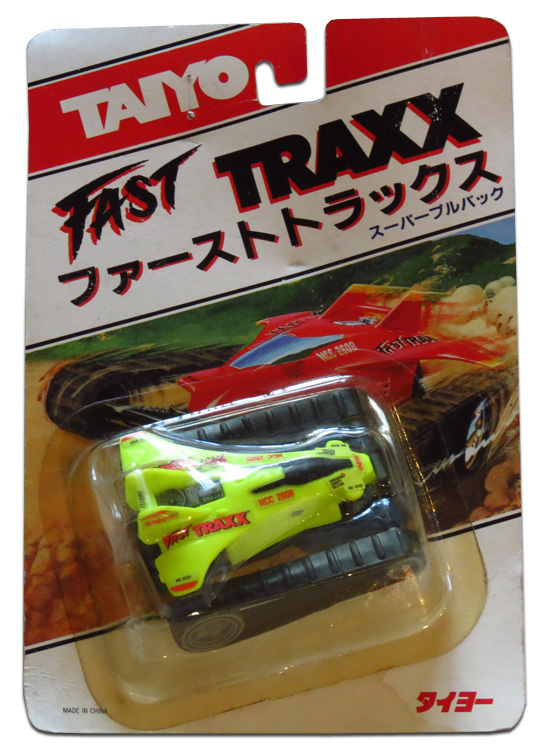 Yes, there were even miniature Fast Traxx toys, like the yellow one pictured here, which is a pull-back model. 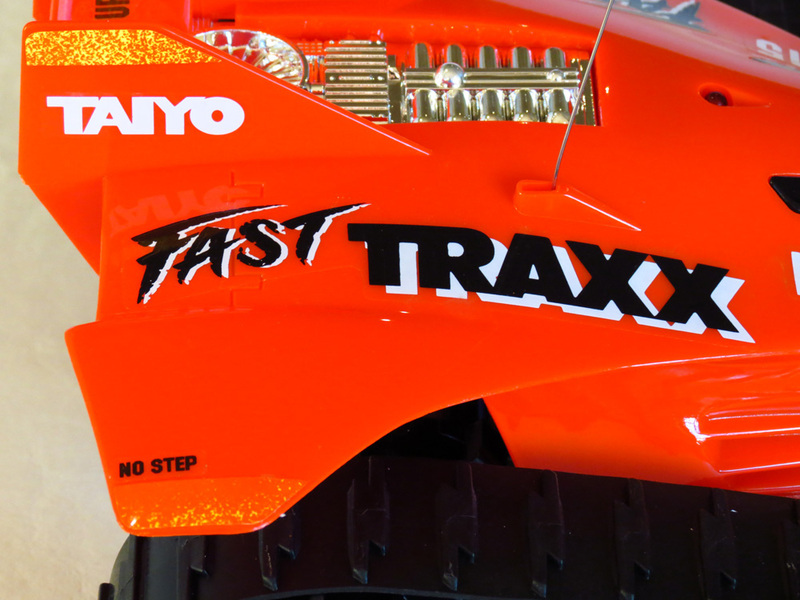 The original Fast Traxx was even re-released by Taiyo before the company shut down, and this short-lived reissue version appears to have been blue and had a different transmitter (see here). It also inspired other companies to adapt the concept. Rival company Nikko released a pretty cool competing series called Super Belt (aka Land Shark) that came in both a Fast Traxx-esque jet fighter shape, mini size, and even truck form. And I can also remember a company called Radcon releasing it’s own high speed tracked vehicle. And there were probably others too, not to mention the usual slew of chinese knock offs (that are often around 20 years later). It was a popular trend that Taiyo started, and which was mainly centred on the period from 1990-1995. So as the years roll by and more 1990s kids start to look back fondly on all the toys of their youth, we can expect all those vintage Fast Traxx cars to grow in stature and significance. 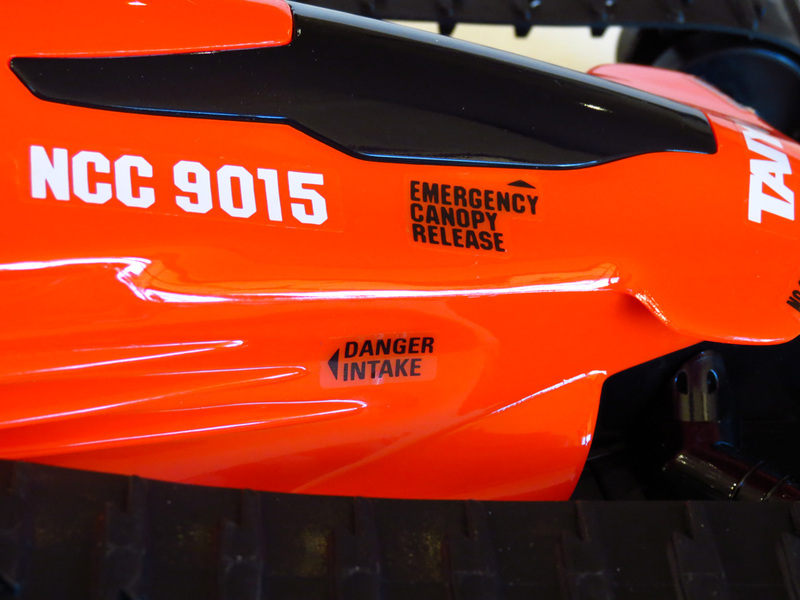 It’s nice to see some facts about this famous R/C car! A few days ago, i found my old red Taiyo/Dickie Space-Hopper (german release). I thought it would be long gone, but it was just on the roof truss of my parents for more than 20 years. I could not believe when I saw the dusty box in the far corner of the roof truss. Long time ago, it was a gift for my ninth birthday back in 1991 and i had so much fun with it. 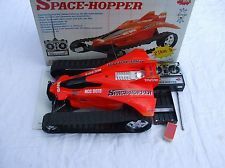 Some friends of mine had other R/C cars like Tamiya Manta Ray and Tamiya Grasshopper, but the Taiyo Space-Hopper (Fast Traxx) shamed them all to dust! Yesterday I’ve bought a 9V batterie for the transmitter and a 9,6V mignonpack with 2300mAh. After more than 20 years, the Fast Traxx still runs without any issues! It’s still a powerful and beautiful R/C toy. Now, i’m 32 years old, but i have the same fun as when i was 9! Some manufacturers should reproduce it with new technology like brushless motors, Lipo batterie, metal gear and frame. I would buy it in a second! hi I am not sure If I missed it in your blog or not but I was wondering what size motors are in the fast traxx. thank you and by the way your post was very imformative. 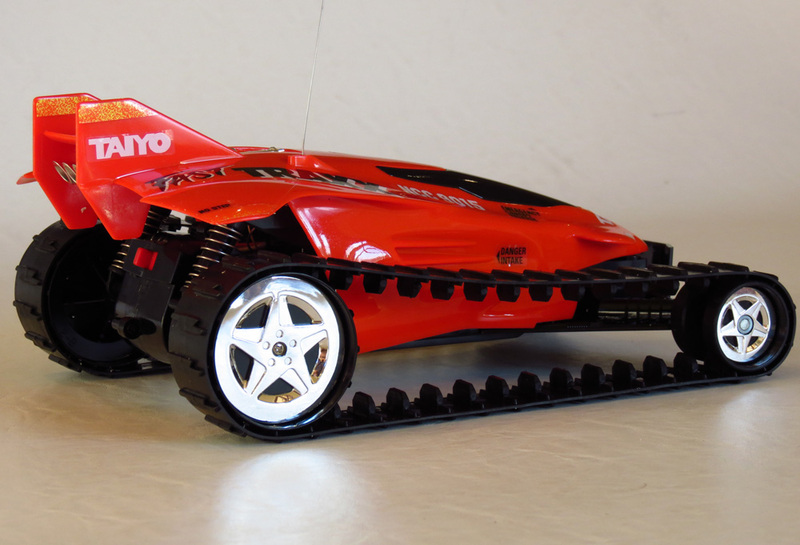 Hi Jeremy – The Fast Traxx had two Mabuchi RS370 motors. The larger 7.2v powered “Super Fast Traxx” actually had two Mabuchi RS380 motors. Hope this helps! found one at the carboot like new recently started collecting rc again after a year break got a fast traxx ,aero buggy and a cosmo 5 and a harley davidson pickup truck and a wave albatross boat all for £8.50 Bargain now looking into to making brushless and fit lipo batteries and make them have a bit more poke to show the tamiya snobs up at local rc meets. does anyone know who the manufacturer of a Maxxis Remote Control Car is? Wow, so nice tho read this. I owned two of these when I was young. The one pictured above and one with a yellow pick-up body. Those cars were so cool. The only issue I had was breaking one of the driveshafts out of the gearbox after a lot of abuse. Those rubber tracks lasted very well and I had lots of fun, even on frozen lakes in the winter. I think I will try to buy one for my son…. Why doesn’t someone make them again.That was the coolest R.C car ever!! I’ll take ten right now. Such a good idea its being remade by a company using the name velocitrax but only 14km/h. my black fast traxx works still today but with 8 aaa batteries. I will by a 9.6 V mignon pack because I love this 24 years old toy. I’ve been looking for a fast Traxx just for parts to salvage a replacement gear for a year! Paul, your only chance of finding spares such as this are on eBay, perhaps from other used examples of the buggy. Which country are you in? I have a fastraxx that has good trap but a blown gear in one of the motor. I’ve been 3D printing a new gear in nylon but only lasts about 2 batteries worth of play time before it slips too.